Capital of the Swiss canton of the same name. Jews first settled there in the early part of the fourteenth century, and soon acquired considerable wealth by lending money. They paid high taxes for toleration, but were allowed to buy and own houses, including the castle of Manegg on the Utliberg and an estate in the Beckenhof. On the whole, they were treated justly by the government, although they were subject to medieval restrictions, being obliged to wear the Judenhut, and probably also the Badge. Of Talmudic authors only Moses of Zurich, the annotator of the "Semaḳ" of Isaac ben Joseph of Corbeil, is known (Neubauer, "Cat. Bodl. Hebr. MSS." pp. 183-184). In 1348 the Black Death brought about a change in the condition of the Jews, who were accused of having poisoned the wells. At the same time they were charged with the murder of a boy, and in 1349 a number of Jews were burned in consequence of these two calumnies. Soon afterward, however, Jews again settled in Zurich, and in 1401, when those of Schaffhausen and Winter-thur were burned on account of the murder of a Christian boy at Diessenhofen, their colleagues of Zurich were protected by the city council against the citizens and gilds, although, for their own security, they were kept in confinement until all danger was over. The hostility of the people and of the gilds made it impossible, however, for the council to keep the Jews in the town any longer, and in the years 1424, 1435, and 1436 decrees of expulsion were issued against them. Two centuries later a Frankfort Jew named Samuel Eiron made a remark derogatory to the founder of Christianity, and was beheaded, whereupon it was solemnly proclaimed throughout the town that no Jew should again be allowed to settle within it unless he had first received special permission. From that date, 1634, until the middle of the nineteenth century no Jews lived in Zurich; nor was it until the emancipation of their coreligionists of Aargau in 1863 that the gates of the city were opened to them. Shortly before this, however, a few Jews, mostly Alsatians, lived in the suburbs of Zurich, where they founded a cemetery. After the emancipation Jews from Endingen and Lengnau, the only two villages in Switzerland in which Jews had always been allowed to live, migrated to Zurich in greater numbers, being followed by their coreligionists from other countries, especially from the neighboring German states. Among the well-known German Jews who lived and died in Zurich was Solomon L. Steinheim. About 1870 the congregation had increased sufficiently to employ a rabbi, the first incumbent being Moritz Levin (now with the Reform Congregation of Berlin); the second, Alexander Kisch (now in Prague). In 1883 a synagogue was built in Löwenstrasse. 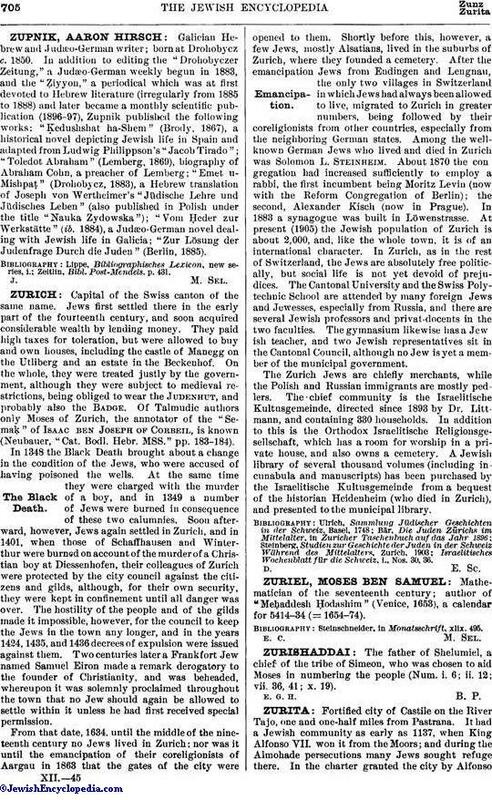 At present (1905) the Jewish population of Zurich is about 2,000, and, like the whole town, it is of an international character. In Zurich, as in the rest of Switzerland, the Jews are absolutely free politically, but social life is not yet devoid of prejudices. The Cantonal University and the Swiss Polytechnic School are attended by many foreign Jews and Jewesses, especially from Russia, and there are several Jewish professors and privat-docents in the two faculties. The gymnasium likewise has a Jewish teacher, and two Jewish representatives sit in the Cantonal Council, although no Jew is yet a member of the municipal government. The Zurich Jews are chiefly merchants, while the Polish and Russian immigrants are mostly pedlers. The chief community is the Israelitische Kultusgemeinde, directed since 1893 by Dr. Littmann, and containing 330 households. In addition to this is the Orthodox Israelitische Religionsgesellschaft, which has a room for worship in a private house, and also owns a cemetery. A Jewish library of several thousand volumes (including incunabula and manuscripts) has been purchased by the Israelitische Kultusgemeinde from a bequest of the historian Heidenheim (who died in Zurich), and presented to the municipal library. Israelitisches Wochenblatt für die Schweiz, i., Nos. 30, 36.